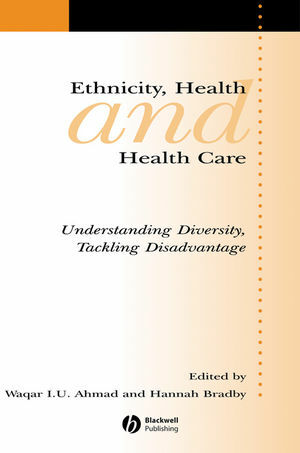 This volume considers the implications of national and international social, political, and economic realities for health and health care provision to minority ethnic groups. Waqar I. U. Ahmad is a leading contributor to research on ethnicity and health, especially in relation to disability and chronic illness. He edited (with Charles Husband) the Open University book series, Race, Health and Social Care. Waqar has published in leading journals in social science (Sociology, Social Science & Medicine, Sociology of Health & Illness, Ageing and Society) and medicine (The Lancet, Journal of Public Health Medicine). He has been a member of the Economic and Social Research Council’s Strategic Research Board (2002-06). Outside of academia, Waqar has been Vice Chair of a Primary Care Trust and Chief Social Scientist at the Office of the Deputy Prime Minister (2001-04). He is Assistant Vice Chancellor (Research and Enterprise) at Middlesex University. Hannah Bradby has published research papers in Sociology of Health & Illness, Ethnicity & Health and Social Science & Medicine, among other journals. Her latest book is an interpretation of medical sociology for medical students, to be published in 2008 and she is the monograph editor for Sociology of Health & Illness. She teaches at the University of Warwick where she co-directs the Institute of Health. 1. Locating Ethnicity and Health: Exploring Concepts and Contexts (Waqar Ahmad and Hannah Bradby). 2. The Black Diaspora and Health Inequalities in the US and England: Does Where You Go and How You Get There Make a Difference? (James Nazroo). 3. Race and Nutrition: An Investigation of Black-White Differences in Health-related Nutritional Behaviours (Peter Riley Bahr). 4. Describing Depression: Ethnicity and the Use of Somatic Imagery in Accounts of Mental Distress (Sara Mallinson and Jennie Popay). 5. Hospice or Home? Expectations of End-of-life Care among White and Chinese Older People in the UK (Jane Seymour, Sheila Payne, Alice Chapman and Margaret Holloway). 6. Contextualising Accounts of Illness: Notions of Responsibility and Blame in White and South Asian Respondents’ Accounts of Diabetes Causation (Julia Lawton, Naureen Ahmad, Elizabeth Peel and Nina Hallowell). 7. Long-term Health Conditions and Disability Living Allowance: Exploring Ethnic Differences and Similarities in Access (Sarah Salway, Lucinda Platt, Kaveri Harriss and Punita Chowbey). 8. Interpreted Consultations as ‘Business as Usual’? An Analysis of Organisational Routines in General Practices (Trisha Greenhalgh, Christopher Voisey and Nadia Robb).